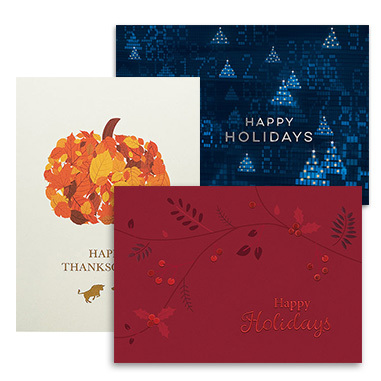 There is no time like the holidays to send corporate greetings! During this season of gratitude and generosity, let your employees and clients know you value their partnership and business with a friendly, professional greeting card. Our talent for niche design can be explored by investors, bankers, stock brokers and other professionals looking for financial themed holiday cards. Our holiday cards for insurance agents, cards for real estate and mortgage professionals, and cards for various other finance and banking industry professionals are available and ready to ship, or be personalized for your market and customer base. Show you care at the holidays with personalization! Add personal greetings and sentiments to your cards to convey your most thoughtful expressions that promote deeper relationships.